A good analogy is easily understood, offends no-one and is memorable. A good analogy can make or break a presentation. It’s always a pleasure to share thoughts and ideas from other presenters on the site. I was pleased to receive this guest from Simon McCormick giving some of his thoughts around the use of a good analogy in a presentation. A good analogy is like a good joke: understood by everyone, offending nobody and memorable enough to be used by others to similar effect. Unlike a joke, it doesn’t have to be funny… but then that’s the thing about analogies; they don’t have to be perfect, just good enough to make their point. Analogies can be a great tool to use when giving a presentation. Apart from the fact that they should help explain a point, they can add some colour, a change of pace or maybe even a bit of humour to the proceedings. It also gives you the opportunity to change your tone of voice and your body language as you aim to make a deeper connection with the audience. A good analogy is almost a break from the formal part of the presentation, a pit stop that allows everyone to draw breath at the end of an explanation or to prepare for the next. 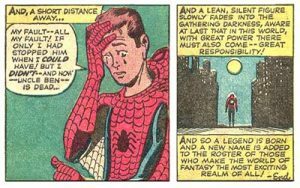 Analogies are a powerful tool but just like Uncle Ben said to Peter Parker: ‘With great power comes great responsibility’. So I, like Baz Luhrmann, would like to dispense my thoughts on the use of analogies based on nothing more reliable than my own meandering experience. Do you need an analogy? Before you start trying to come up with an analogy just stop and think, do I really need one? Remember, for all their power, analogies are NOT what you are trying to get across, they are a tool to help you explain or illustrate something else. They are, by their nature imperfect and one step removed from your goal so, if you can explain your point simply and clearly as it is, do so. There are few things as painful as a presenter having to explain an analogy at length, trust me if it takes that much effort to explain then you need to find a better analogy. Think Hugh Grant trying to say ‘I love you’ to Andie MacDowell in Four Weddings and a Funeral…it might be endearingly foppish in a Richard Curtis romantic comedy but in real life, it’ll just be irritating. An analogy only works if the person hearing it understands what you are talking about. Medical speciality, age, country and culture are just a few of the reasons your well-chosen analogy will fall flat on its face. The beloved TV, books and music of our youth may be a rich mine for analogies but anyone born ten years after you is unlikely to understand. Be wary of specific sporting analogies too, believe it or not, not everyone understands the offside rule, what a quarterback does or why NASCAR even exists. In the famous Star Trek: The Next Generation episode ‘Darmok’ (see how I’m alienating some of you with this) Captain Jean Luc Picard and his crew find themselves struggling to communicate with a race called the Children of Tama who speak in an analogy based language. It is only after they have a common experience (fighting off an invisible monster, obviously) that communication can finally begin. Instead, a really good analogy reaches deep into the collective experience of the audience, connecting at an emotional level and helping not just explain but motivate the listeners. Remember, the analogy shouldn’t be the star of the show: it is a tool to help explain something else. If the analogy is distracting because it is too funny, too unpleasant or too controversial the danger is that it overwhelms the main point and becomes what your audience remember. Ultimately, whilst a really good analogy may be funny, unpleasant or controversial it should be remembered because it points brilliantly to the issue at hand. Don’t apologise for its failings. Don’t stretch it too far! As I said above, an analogy is only supposed to be a bit like your main point, not the same as it. If you start stretching your analogy you are inviting your audience to do the same and this creates a couple of problems. Firstly they will start to get distracted, wondering how much further they can take it themselves and then, inevitably, they will start to see the areas where the analogy differs. Either way, they are no longer listening to what you are saying and you risk the analogy being the only thing they remember. Keep it smart by keeping it simple. The thing is, most urban myths aren’t true so if you use one some smart a**e will point it out at the end and that will distract from the learning. Alternatively, everyone knows it isn’t true already, can’t believe that you don’t and now think they can’t trust anything else you say. Always do a fact check if using a real life example and remember; a duck’s quack does echo, you can’t see the Great Wall of China from space and Walt Disney wasn’t cryogenically frozen! Whilst a good analogy will never win an argument or prove a point, it can help clarify difficult concepts, cut through distracting details and add emotional pull to a presentation. It can inspire an audience to listen, stimulate a desire to learn and plough the ground of a hardened mind, in preparation for the seeds of learning to be sewn. Instead, we should choose a really good analogy which reaches deep into the collective experience of the audience, connecting at an emotional level and helping not just to explain a point to the listeners but motivating them to care and act as well.